It is with great pleasure that Connecting Country announces Jacqui Slingo has joined Connecting Country as a project officer managing our on-ground works program. Welcome Jacqui! Jacqui is thrilled to be working alongside and supporting a community dedicated to improving and enhancing native vegetation in the Mount Alexander region. She officially started with the team this week after a handover from our botanist Bonnie Humphreys, who is on maternity leave. Jacqui has previously worked in the Mount Alexander region supporting private land conservation. Her experience includes numerous vegetation and wildlife monitoring projects throughout south-eastern Australia. Jacqui is excited to return to the region with a view to live here long-term. She enjoys cooking from her garden when she can, yoga and appreciating new places to enjoy in the bush. 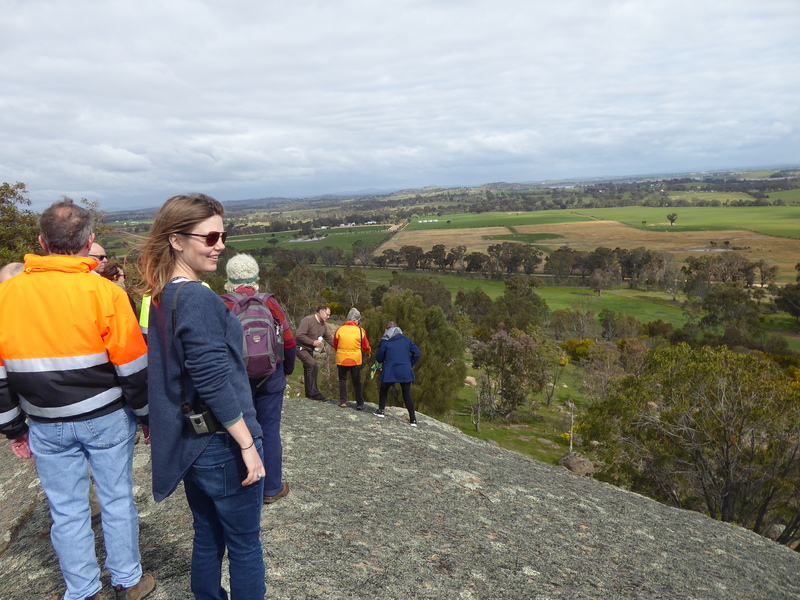 Jacqui takes in the Baringhup landscape scenery from a granite rock at the recent Birds on Farms workshop (photo by Frances Howe).